This section Helpful Tips is all about Frequently Arising Questions. Brahmanda Guruji Sri Narendra Babu Sharmaji, share the knowledge on general topics and Hindu Sanathana Dharma in his Television Programme - Lakshmi Kataksha, telecasted in Kasthuri Kannada Channel, which i have put in this section. Guruji also share information of knowledge on Vasthu Shastra and lot of Helpful stuffs. Many People have lot of doubts on Hindu Sanathana Dharma, which is also covered in this section. Please do ask a priest or elders, if you have any doubts in below, who knows very well about our customs and practices and clarify the same. Brahmanda Guruji Shri Narendra Babu Sharmaji spoke on Lord Sri Kala Bhairava and Ashta Kala Bhairava. The same has been updated in this section. Kala Bhairava organizes every individual's personal time. For example, one person works for a minimum wage of Rs.70 an hour. Someone else makes Rs.700 an hour. Still someone else makes nothing in an hour. The person who makes nothing in an hour is absolutely insulting time. If time is unfavorable to you, and you realize that your time is not spent properly, then you can go and pray to Kala Bhairava. Present a request to Kala Bhairava to help you to better organize how you spend your time. The renowned scientist Albert Einstein understood that physical reality as four-dimensional, rather than as a three-dimensional existence, with time as the fourth dimension. The Siddhas, or inner scientists of South India, knew this much in advance. They were aware that time is organized differently on various planets. While time moves slowly on planet Earth, it moves faster on planets vibrating at a higher frequency. Kala Bhairava is the deity who is known to manage time on all the planets. According to the Siddhas, there is what is known as the Kala Bhairava universe. A divine being called Kala Bhairava rules the universe. In astral travel the Siddhas made visits to the Kala Bhairava universe and gave a description of what the God (Kala Bhairava) looked like. He is dark in complexion, fierce looking, and has a dog as his vehicle. Kala Bhairava has a significant place in all the main temples devotes to Shiva. He is one of the most-feared deities, but actually, he is one of the most rewarding ones. Lord Kala Bhairava is that manisfestation of Lor Shiva who manage time (Kala). Time Shakti or Time Energy was created by Kala Bhairava in all of the galaxies. He through Time Shakti created milliseconds, seconds, minutes, hours, days, weeks, months and years. 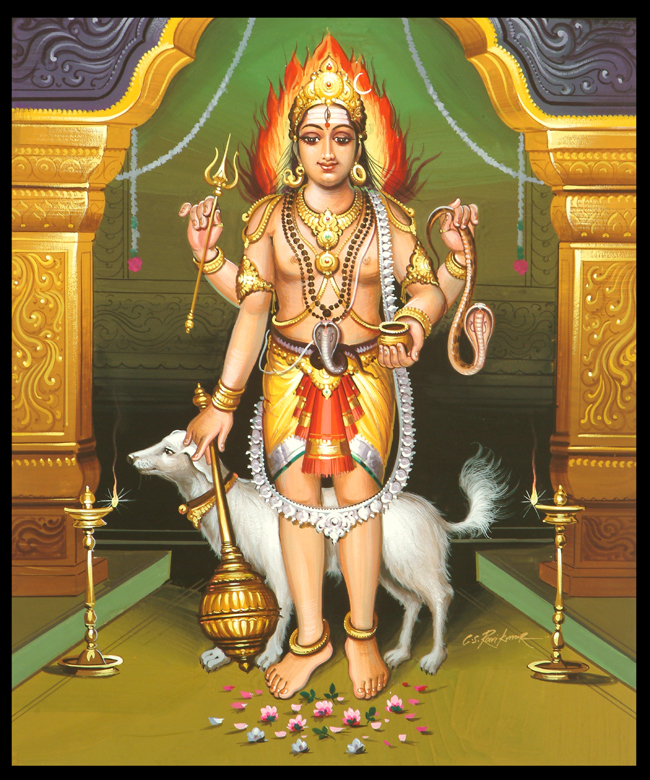 If one receives instant enlightenment or prosperity or recovery from debt or illness it is the work of Bhairava. Tantric and anyone who seeking divine power to tackle problems that seems to have no solutions, surrender to Kala Bhairava. He can solve most of the problems, which are pending for a long time. There is nothing more precious than time. So intelligent humans should use every moment effectively on the spiritual path. Those, who want to do this, can get the divine help of Kaala Bhairava, if they request Him with sincerity. Lord Kala Bhairava is worshipped by Yogis and Tantrics to attain Siddhis. Lord Kala Bhairava is regarded as the guardian of Yogis and Tantrics, who attain accomplishment of mantras by doing Sadhana (devotion). Many astrologers and tantricks keep Kala Bhairava with them, to enhance their occult knowledge. Some forms of Kala Bhairava embody a wrathful energy which we can use for destroying negativity and for protecting us as well. These tremendous energies emphasize why it is important to honor Kala Bhairava, The Lord of Time. If you encompass his grace, you will find yourself in the right place, at the right time surrounded by the people that will enhance your life to greatness. Bhairava can force you to jump over the bad time choices you make in the form of laziness, lethargy and idleness. You must also obtain the consciousness to discontinue unrewarding action, even in your own job. Kala Bhairava will not only show you the vision of what it is you want to create, but he will also give you the exact knowledge and clarity of how to get it. So why zig zag through life to get to your goal, when Kala Bhairava can give you that 1 direct path to your goal. It is a common human belief that working hard and long hours will give us the greatest rewards. This is a misconception. The Wisdom of Bhairava can transform the power of your hours into seconds, just by accepting his intentional energy. You can use the following Mantra 108 times during Kala Bhairava Ashtami (waning 8th moon) : 'Hmmm Hram Kala Bhairavaya Namaha'. Kaal Bhairav Ashtami is dedicated to Lord Shiva and on this day he is worshiped as Kaal Bhairav is the God of Time. Kaal means ‘time’ and ‘Bhairav’ the manifestation of Shiva. All krishna paksha ashtamis are dedicated to Bhairav ji, but out of the 12 krishna ashtamis in a year, the one which falls in the month of Margashirsha is very auspicious. It is believed that on this day, Lord Kala Bhairav appeared on Earth. This is known as Kala Bhairava Ashtami Pooja. Though Kaala Bhairava is the most important and central Bhairava, he is not counted among the eight traditional Bhairavas in the eight different directions of the holy city. Bhishana Bhairava protect the north. It is interesting to note that in Buddhism, the Defenders of the law (Dharmapala) are also grouped in eight (The Eight Terrible Ones). Like the eight Bhairavas, they are related to this other group of gods called the Ashta-Dikpala , the guardians of eight directions, known already in the Veda. 8) Ishana, of the north-east. "varanasyam bhairo devam sansaar bhai nashanam, anek janma kritam papam darshanen vinashyati"